First things first: Christophe Baron is the Bionic Frog. That’s the nickname the Australians gave this indefatigable Frenchman when he worked a harvest there in the mid-1990s and the name he chose for what would become one of Washington’s top cult wines in the decade that followed. Baron showed me a complete vertical tasting back to year one (2000) in Seattle at the end of July. The wines stunned with their richness, complexity and Old World wildness. This is truly one of America’s handful of great Syrahs — and it’s not Baron’s only wine on my short list. At the time, there had been no commercial vineyards for 40 years in this area. Blue Mountain Cellar had been making Cinsault there, which they called “Black Prince,” but a severe freeze in November of 1956 wiped out most of the apple, cherry and plum orchards in Walla Walla Valley, along with its grape vines. Baron’s intention was to create the first “modern-day vineyard” in the stones. Baron planted the 10-acre Cailloux vineyard in March of 1997, then added Coccinelle (a 4.5-acre parcel of which 3.7 are now under vine) and En Cerise (10 acres) in 1998, all on their own roots. He then added En Chamberlin (10 acres) in 2000, with the vines grafted onto phylloxera-resistant rootstock, then created the high-density, seven-acre Armada vineyard in 2001. 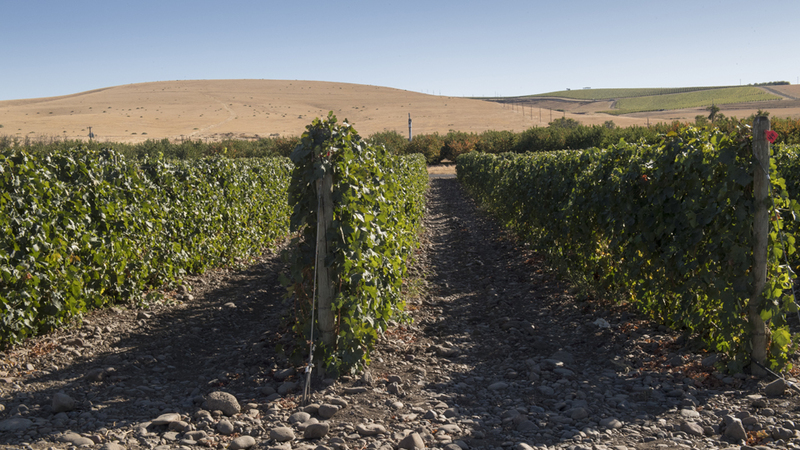 Since those early years, Baron has made major additional investments in Walla Walla Valley, including the La Patiencia vineyard north of Armada (the No Girls wines are made by Baron’s “assistant vigneronne,” Elizabeth Bourcier) and his Horsepower project, from the densest vineyard in Walla Walla Valley, planted at 3 feet by 3 feet and worked with a horse. His most recent undertaking is a 2.2-acre Syrah vineyard he planted in 2011 on a slope in the foothills of the Blue Mountains that’s so steep the vines must be worked with a winch. The 2014 bottling of this new wine (called Hors Catégorie), which I tasted on the same day as the Bionic Frog vertical, would give a topnotch Hermitage a run for its money. The Bionic Frog Syrah emerges from the Coccinelle vineyard. The first vintage was 2000. Baron also made a separate Coccinelle Syrah from the same parcel of vines through 2003. But while the Coccinelle bottling was made from destemmed fruit, the Bionic Frog started with 25% whole clusters and is now much higher than that, typically at least 50%. As with Cailloux and en Cerise, Coccinelle was planted with a Phelps clone of Syrah by way of Red Willow Vineyard in western Yakima Valley. The Rocks District of Milton-Freewater is unique for its well-drained dark soil rich in basalt cobblestones. 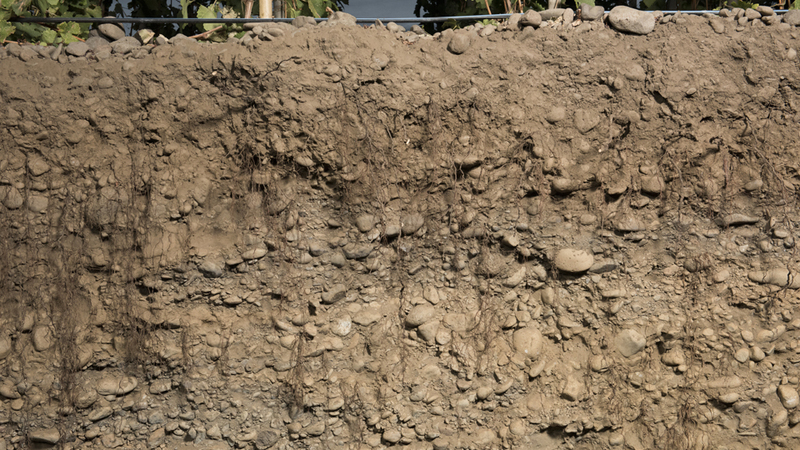 The mostly very thin layer of wind-blown silty topsoil, which is mountain wash-off from the last 10,000+ years, varies in depth within this area, but underlying it all is a deep layer of compressed stones extending down hundreds of feet that the vines’ roots are able to penetrate. The cobblestones on the surface absorb solar radiation during the day and return it to the vines at night, promoting growth early in the season and aiding the ripening process in late summer and early fall. The Coccinelle vineyard, located in the southeast section of The Rocks not far from the town of Milton-Freewater, is 940 feet above sea level — relatively high for The Rocks — and as it is close to the foothills to the south, there’s a bit more soil on the surface here. The result is less vine stress: Coccinelle is routinely the first vineyard Baron harvests, and the Bionic Frog is characterized by its broad mouthfeel and silky, almost Burgundian tannins. At the outset, Baron made the Bionic Frog in a stainless steel tank. He has never carried out a pre-fermentation cold soak, but because he picks the fruit during the cool mornings and does not inoculate with commercial yeasts, the fermentations typically take four or five days to begin. Baron practices what he describes as “very light” extraction, doing some light pumpovers at the beginning and some punchdowns later on, depending on the needs of the vintage rather than on a set recipe. The Bionic Frog spends up to three weeks on its skins, including some post-fermentation maceration. It’s racked following the malolactic fermentation and then again for the bottling 18 months after the harvest, although in some years there may be an additional racking in between if the wine is too reduced. Baron’s original model for Bionic Frog was the legendary Cornas made by his friend Noël Verset, who convinced him to vinify with whole clusters. Over the years, though, Baron became less concerned with making a Cornas-like Syrah and more obsessed with crafting wines that speak clearly of their place character. Purity of taste and aromas is critical to Baron, and thus he quickly stopped leaving his wines on their gross lees in order to make cleaner, more focused wines. Baron used so-called “magic casks” made by Burgundy producer Dominique Laurent’s small cooperage (thick-staved, very fine-grained barrels from old trees in the Tronçais forest that Laurent personally selects) from the outset through 2008, including about 20% new oak. He bought his first 1,200-liter foudre in 2009 and now ages each new vintage of the Bionic Frog in a single foudre and the rest in 600-liter puncheons, about 15% new. Beginning with vintage 2006, Baron has fermented the Bionic Frog mostly in concrete, which he feels gives more mid-palate texture to the wine than stainless steel. From the start, Baron has buried his low-growing vine canes in order to protect his vineyards in The Rocks against the risk of damaging winter frost. He uncovers them in early March, after the freeze risk has ended, cutting back any affected trunks and re-training the canes that had been protected to replace the parent vine. The local old-timers thought he was crazy to go to such efforts, but in 2004, when frost in January cost many growers most of their crop in The Rocks, Baron lost just 20% of his production (he actually accounted for the majority of Rocks fruit that year). This past winter, when numerous growers in The Rocks lost much of their 2017 crop to frost, Baron’s production was off by just 10%. Baron has farmed his vines organically from the beginning, and in 2002 he adopted biodynamic principals. The vineyards were originally certified by Demeter, but Baron walked away from the association “because it was like having a policeman looking over my shoulder — and the amount of money that it cost me every year could have been better spent buying Burgundies.” Moreover, full biodynamic methods in the winery forbid acid adjustments, and Baron has always done judicious acidification of his musts from The Rocks. According to Baron, his switch to biodynamic farming has resulted in “more salinity, tension and verticality” in the wines. And in more recent years, it has allowed him to get better phenolic ripeness at lower sugar levels, which is the Holy Grail in a hot, dry region like eastern Washington. Baron emphasized to me that he has always picked on taste and phenolic ripeness, never on numbers. Although potential alcohol levels were consistently high in the early years, Baron never added water to his must. “I don’t turn water into wine,” he deadpanned. The Bionic Frog is an explosively rich Syrah with a flamboyant Old World character. Early on, says Baron, “it is more about the palate than the flavor profile,” showing a generous, velvety mouthfeel with plush tannins and no rough edges. “It’s spherical like Romanée-Conti, while En Chamberlin is more like La Tâche and the Armada is like Richebourg,” he said with a straight face. With bottle aging, the wine often develops a distinctive element of black truffle juice, as well as the flinty, iodiney minerality shared by Baron’s other Syrah bottlings from The Rocks. In my vertical tasting, the maturing bottles showed floral/spicy/earthy balsamic qualities, as well as notes of game, olive tapenade, pepper, mocha, woodsmoke and leather. As the early vintages were high in octane, many consumers, including some who had read about but never actually tasted the Cayuse wines, criticized them for being too extreme or for not aging well. But I suspect that most of these early doubters would be surprised to hear that during the recent string of very warm vintages (2013 through 2016), the Bionic Frog has been bottled with less than 14% alcohol. The iron and manganese in the soil at Coccinelle also contribute qualities to the wine that provide lift, such as a range of mineral notes and blood orange. 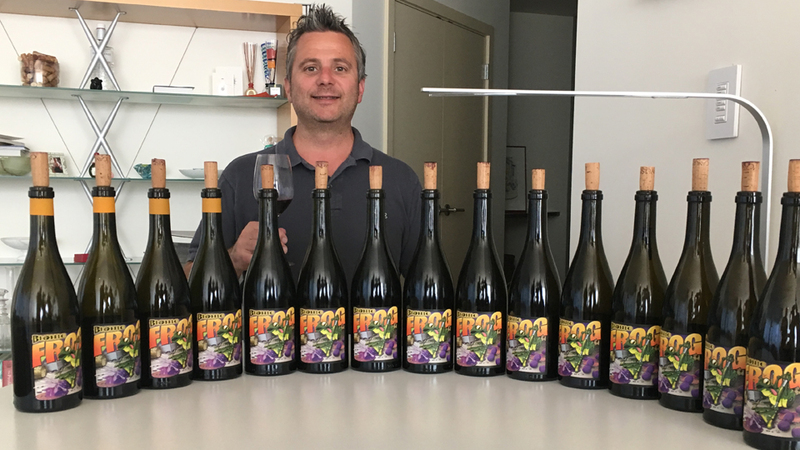 Although the Bionic Frog is rarely austere on release, the vertical tasting indicated that the strongest vintages will just be rounding into peak form a decade after the vintage. Baron recommends that his mailing list customers who are lucky enough to have an allocation of a single three-pack open a bottle on release, then after five and ten years. He finds five to eight years after the harvest to be the typical sweet spot for Bionic Frog. Typical annual production of Bionic Frog is about 400 cases, and the current vintage was released at a price of $105.